Recipe adapted from Power Vegan Meals by Maya Sozer. [Recipe makes 4 servings]. We recently came across a new cookbook by Maya Sozer (linked above) and fell in love with the photos. After looking around for bright colors for a fun summer recipe, we decided to give her version of pad thai a try. Anytime a recipe calls for stir frying vegetables, we're in, because it keeps the crispness, freshness, and bold colors of each type of vegetable. In addition, we liked the healthy twist that Sozer gave the sauce since it gave the dish extra protein, fiber, and calcium. 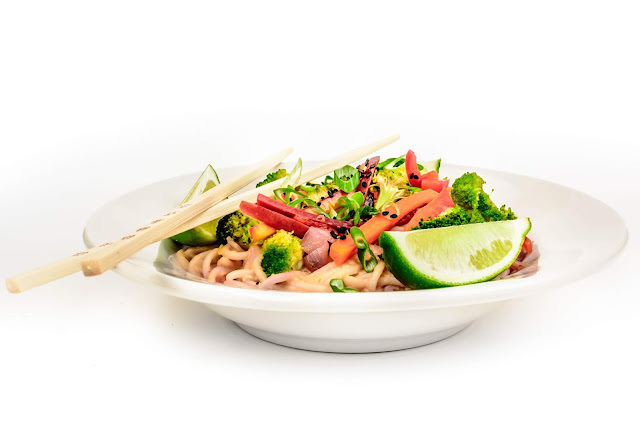 Serve the pad thai up with some fresh scallions and lime wedges on top as well as a cool lime-based drink, and you're set for an enjoyable and healthy summer meal. For the peanut sauce, add the water, white beans, peanut butter, apple cider vinegar, lime juice, coconut aminos, maple syrup, ginger, garlic, and crushed red pepper flakes to a food processor and process until smooth. Check for desired consistency, and incorporate more water if needed. Reserve. For the cooking sauce, whisk together the lime juice, maple syrup, and coconut aminos in a small bowl. Reserve. For the noodles, bring a pot of water to a boil and cook the pasta according to the package instructions. Once cooked, drain and rinse under cold water to stop the cooking. Lastly, start on the veggies by heating the coconut oil in a large sauté pan over medium-high heat. Add the onion and cook for 4 minutes. Add the garlic and red pepper flakes and cook for an additional minute. Add the carrot, broccoli, red bell pepper, and green onions, and cook for 2 minutes. Lastly, add the noodles and cooking sauce and cook for a final 2 minutes. Serve the pasta and veggies in individual bowls, and top with the peanut sauce. [Side note: Alternately, the peanut sauce can be incorporated with the remaining ingredients by adding it to the pan when the noodles and cooking sauce are added].